Contact Kendall Toyota of Bend today for information on dozens of vehicles like this 2019 Toyota Corolla LE. This Toyota includes: SPECIAL COLOR MUDGUARDS (PPO) 50 STATE EMISSIONS *Note - For third party subscriptions or services, please contact the dealer for more information. * Just what you've been looking for. With quality in mind, this vehicle is the perfect addition to take home. The 2019 Toyota exterior is finished in a breathtaking Blizzard Pearl, while being complemented by such a gorgeous Ash interior. This color combination is stunning and absolutely beautiful! There is no reason why you shouldn't buy this Toyota Corolla LE. It is incomparable for the price and quality. This 2019 Toyota Corolla SE is proudly offered by Kendall Toyota of Bend This Toyota includes: 50 STATE EMISSIONS MUDGUARDS (PPO) *Note - For third party subscriptions or services, please contact the dealer for more information. * This is the one. Just what you've been looking for. The Toyota Corolla SE will provide you with everything you have always wanted in a car -- Quality, Reliability, and Character. This vehicle won't last long, take it home today. This 2019 Toyota Corolla XLE is offered to you for sale by Kendall Toyota of Bend. This Toyota includes: 50 STATE EMISSIONS MUDGUARDS (PPO) *Note - For third party subscriptions or services, please contact the dealer for more information. * The look is unmistakably Toyota, the smooth contours and cutting-edge technology of this Toyota Corolla XLE will definitely turn heads. You can finally stop searching... You've found the one you've been looking for. There is no reason why you shouldn't buy this Toyota Corolla XLE. It is incomparable for the price and quality. Contact Kendall Toyota of Bend today for information on dozens of vehicles like this 2020 Toyota Corolla L. This Toyota includes: 50 STATE EMISSIONS *Note - For third party subscriptions or services, please contact the dealer for more information. * The Toyota Corolla L will provide you with everything you have always wanted in a car -- Quality, Reliability, and Character. This is about the time when you're saying it is too good to be true, and let us be the one's to tell you, it is absolutely true. Based on the superb condition of this vehicle, along with the options and color, this Toyota Corolla L is sure to sell fast. This 2020 Toyota Corolla LE is offered to you for sale by Kendall Toyota of Bend. This is the one. Just what you've been looking for. Just what you've been looking for. With quality in mind, this vehicle is the perfect addition to take home. This is about the time when you're saying it is too good to be true, and let us be the one's to tell you, it is absolutely true. You've found the one you've been looking for. Your dream car. You can find this 2020 Toyota Corolla SE and many others like it at Kendall Toyota of Bend. There is no reason why you shouldn't buy this Toyota Corolla SE. It is incomparable for the price and quality. Just what you've been looking for. With quality in mind, this vehicle is the perfect addition to take home. You could keep looking, but why? You've found the perfect vehicle right here. This is the one. Just what you've been looking for. This outstanding example of a 2020 Toyota Corolla Hybrid LE is offered by Kendall Toyota of Bend. The 2020 Toyota exterior is finished in a breathtaking Celestite Gray Metallic, while being complemented by such a gorgeous Light Gray interior. This color combination is stunning and absolutely beautiful! There is no reason why you shouldn't buy this Toyota Corolla Hybrid LE. It is incomparable for the price and quality. You've found the one you've been looking for. Your dream car. The Toyota Corolla Hybrid LE will provide you with everything you have always wanted in a car -- Quality, Reliability, and Character. Contact Kendall Toyota of Bend today for information on dozens of vehicles like this 2020 Toyota Corolla Hybrid LE. You can finally stop searching... You've found the one you've been looking for. Look no further, you have found exactly what you've been looking for. This is the one. Just what you've been looking for. You've found the one you've been looking for. Your dream car. Contact Kendall Toyota of Bend today for information on dozens of vehicles like this 2020 Toyota Corolla Hybrid LE. You can finally stop searching... You've found the one you've been looking for. Based on the superb condition of this vehicle, along with the options and color, this Toyota Corolla Hybrid LE is sure to sell fast. You've found the one you've been looking for. Your dream car. You could keep looking, but why? You've found the perfect vehicle right here. Contact Kendall Toyota of Bend today for information on dozens of vehicles like this 2020 Toyota Corolla SE. Based on the superb condition of this vehicle, along with the options and color, this Toyota Corolla SE is sure to sell fast. You've found the one you've been looking for. Your dream car. The Toyota Corolla SE will provide you with everything you have always wanted in a car -- Quality, Reliability, and Character. There is no reason why you shouldn't buy this Toyota Corolla SE. It is incomparable for the price and quality. Kendall Toyota of Bend is excited to offer this 2020 Toyota Corolla. This vehicle won't last long, take it home today. The Toyota Corolla XLE will provide you with everything you have always wanted in a car -- Quality, Reliability, and Character. Just what you've been looking for. With quality in mind, this vehicle is the perfect addition to take home. The look is unmistakably Toyota, the smooth contours and cutting-edge technology of this Toyota Corolla XLE will definitely turn heads. Say hello to the new Toyota Corolla at Kendall Toyota of Bend! One of the best-selling sedans in America for the past several decades, the Corolla is known for dependability and longevity. Stylish and comfortable with an athletic flair, the Corolla is a fantastic value with impressive gas mileage and an exceptional resale value. Available in the Toyota Corolla L, Corolla LE, Corolla LE Eco, Corolla XLE, Corolla SE, and Corolla XSE trims with a long list of configuration options and several available premium feature packages to choose from, there is a Corolla perfect for any driver. Begin your search for the perfect Toyota Corolla by browsing our available Bend Toyota dealership inventory. If you have trouble finding what you’re looking for or have any questions whatsoever, contact us online or over the phone and our friendly team of knowledgeable professionals will be happy to assist you. Smart, reliable, and easy on the eyes–the Toyota Corolla in Bend is the car you’ve been searching for. After browsing our available inventory of the Toyota Corolla here at Kendall Toyota of Bend, stop by our showroom and take one for a test drive. Our Toyota dealership is conveniently located at 61430 S Hwy 97 Bend, Oregon 97702. We are just a short drive away from the communities of Terrebonne, Prineville, and Madras. While you’re here, visit our Toyota Finance Center and we’ll help you explore your options and get your finance application started for a Bend car loan. We work with all types of credit and will find the right lease or loan for you budget. Have a trade-in? Great! 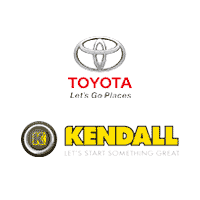 At Kendall Toyota of Bend we not only sell cars, we purchase them too. Check out our online trade-in value form to get the true market value of your current vehicle. Then bring it to us and let us help you get out of the old and into the new with ease. The Toyota Corolla comes with choice of a 140-horsepower, 1.8-liter engine or a 132-horsepower, 1.8-liter engine combined with a standard six-speed manual transmission. Also available is a six-speed manual transmission with overdrive, a four-speed automatic transmission with overdrive, and a two-speed continuously variable transmission with overdrive. Paired with front wheel drive, front independent suspension, and electric power steering with a tilt and telescopic steering wheel, the Corolla has a smooth and comfortable ride with firm handling. 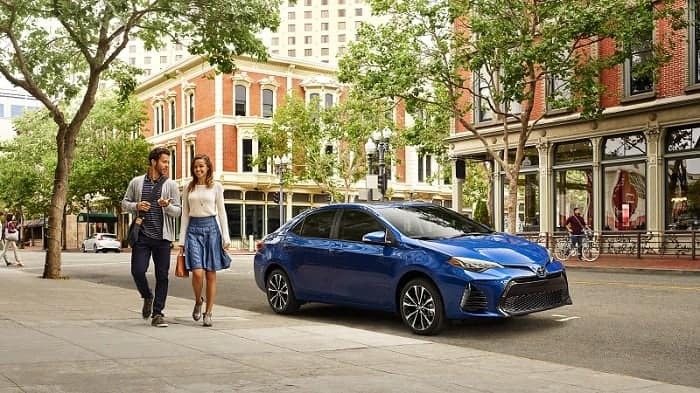 Awarded a five-star overall rating by the National Highway Traffic Safety Administration, the Toyota Corolla has several notable standard and safety features. Some standard features in Toyota’s Star Safety system include are all-season tires, four-wheel anti-lock braking system with emergency brake assist, LED daytime running lights, electronic stability and traction control, tire pressure monitoring, and a suite of eight standard airbags. You won’t be bored in your new Toyota Corolla while you navigate traffic listening to a six-speaker sound system with USB connection and iPod connectivity. Bluetooth wireless data link for hands-free calling and audio streaming is also included. Upgrade to include the available Entune multimedia infotainment system with Entune premium Audio with a six-inch touchscreen, voice controls, app integration, and Siri Eyes-Free mode for iPhone. Other add-on premium features include heated seats, smart key entry, push button start, a full navigation system, and a backup camera. From the head-turning LED headlights to the angled contours of the body to the soft-touch materials in the upscale interior that boasts an ample amount of leg room, you’ll find a lot to love about the new Toyota Corolla. Make the smart move and come to Kendall Toyota of Bend today, where the perfect Toyota Corolla is waiting just for you!